(WBAP/KLIF) – Reports of a fire at the historic Notre Dame Cathedral in Paris spread around the globe Monday. The 12th century cathedral is undergoing a $6-million-dollar renovation project, but the exact cause of the fire is under investigation. 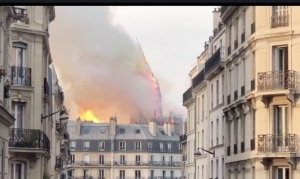 The Deputy Mayor of Paris said the cathedral suffered “colossal damages” from the fire that started in the spire and caused it to collapse.